As it is now 3 years since my previous post on this one, I think an update on progress is overdue. Although this is categorised as a global trust, 70% of the portfolio are UK listed equities. The rationale for this is that most of these companies derive a significant proportion of their profits from overseas operations. The remainder of the portfolio are comprised of Europe (8%), N. America (12%) and Asia/Japan - mainly via funds (7%). The trust has today issued results for the full year to 31st December 2016 (link via Investegate). Net Assets total return for the year was 16.9% compared to 16.8% for its benchmark FTSE All Share Index. This is a good return for just one year, however, compared against other trusts in the same global sector, it is near the bottom of the table. Trusts such as Bankers, Alliance Trust and Monks have returned over 40% in 2016. 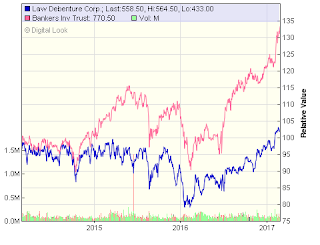 Likewise over the past 5 years Law Debenture is propping up the bottom of the league table with a return of 72% compared to well over 100% for the likes of Witan, Bankers and Foreign & Colonial for example. Revenues increased by 2.5% to 18.56p per share and the proposed full year dividend will be increased by 3.0% to 16.7p (2015 16.2p). The trust has either held or increased the dividend in each of the past 46 years. In addition to the investment trust, it also has a fiduciary services business which contributes to overall profits but the value of this business. Earning from this business were 7.6p per share and the value the fiduciary business is estimated at 62p per share. The costs remain low with ongoing charges at just 0.45% and no performance fee. Also portfolio turnover rate is low at around 10%. I now have to review whether to continue holding LWDB in my SIPP drawdown portfolio due to the underperformance compared to other options. Having said that, the return of 72% over the past 5 yrs is better than my Vanguard LS 60 and it provides a steady natural income - current yield is 3.0%. I should have a decision by the time of my SIPP portfolio review in June. As part of my revised strategy to wind down my individual shares portfolio, Unilever was sold last April at the price of £33 and the proceeds recycled into Vanguard Lifestrategy which has done really well partly due to the boost from the fall in sterling post the referendum. Strangely, this fall in the value of the pound has resulted in me revisiting Unilever because their dividends are in Euros and after conversion, investors in the UK get around 15% more now compared to previous years. This, combined with a dip in the share price following the full year results persuaded me to bring the shares back into the fold as I have spare cash earning nothing in my SIPP account. The shares were repurchased just two weeks back to qualify for the final dividend. The price was £31.60, slightly below my sale price last year. Today the shares were boosted to £38 by the announcement of a bid from Kraft Heinz for $143bn. 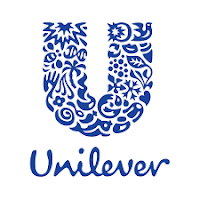 The offer has been rejected by Unilever but as this is the opening gambit, I am sure there will be an increased offer down the line. Luckily I am sitting on an instant gain of 20% which should help to offset some of my capital losses on other holdings - Next, Amec Foster etc. this past year or so. I will wait to see how the bid unfolds and in the meantime collect the quarterly dividends which have been boosted by the fall in sterling. Kraft now have 30 days to come up with an increased bid. A 4th quarterly dividend of 32.01 euros - 27.68p will be paid in March. This will make a total of 128 euros for the full year. I expect an uplift for the coming year to around 135 euros which would translate to ~115p compared to 109p in 2016. Although dividend income will be affected by currency fluctuations, these things have a way of balancing out over the longer term. In any event future divis may well be in US dollars soon! Feel free to leave a comment below with your thoughts on the takeover bid. 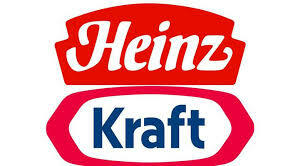 Looks like the merger is off as Kraft have reportedly decided not to pursue a deal. They have today published full year results for 2016 (link via Investegate). The past 12 months has been much better than the previous year with total return of net assets increasing by 20.4% compared to a gain of 16.8% for the FTSE All Share index. 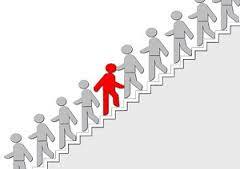 The contrarian approach often requires long periods before the benefits for the trust are realised. 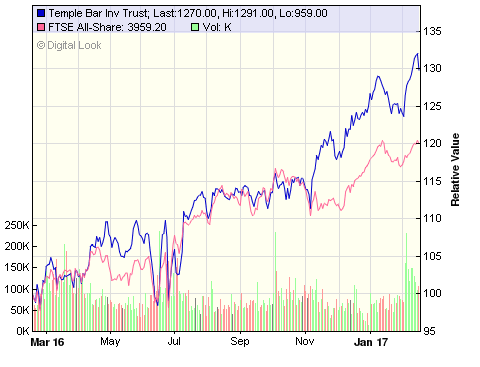 Despite a post-Brexit wobble, Temple Bar emerged from 2016 with the best one-year NAV total returns of any of the mainstream UK income trusts. Temple Bar's attractions include ongoing charges of just 0.62%, a natural dividend yield of 3.2% and the third-best 10-year total returns in the UK equity income sector (behind my other holdings Edinburgh and Finsbury) despite a poor run in 2014 and 2015. I am hoping maybe the tide is at last turning in favour of value investors. The trust is committed to paying a rising dividend year on year and has met this commitment for the last 33 years. The board are recommending a final dividend of 16.18p making 40.45p for the full year - an increase of 2% on 2015. The dividend is covered by income receipts of 43.74p. In my report last year, the share price has lost around 16% over the previous 12 months, so things seem to be back on track. The share price appreciation over recent months means the yield has reduced from 4.0% last year to currently ~3.2%. I took the opportunity to reduce my holding in TMPL a couple of years back but I am happy to continue with the remaining shares for the longer term. Feel free to leave a comment below if you have any thoughts on this investment trust. 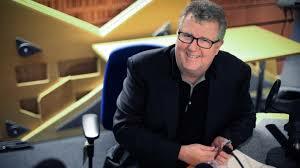 I drifted into retirement at the age of 55 yrs. The partnership I worked in on the edge of Dartmoor (hence covers for my books) wound down and we all went our separate ways. After a short break, I looked at my savings, investments and pension pot and realised I could probably make a couple of changes to my portfolio and get along just fine on the income I could generate with the option to convert my pension at a later date to income drawdown. Basically, the amount I needed to retire on was not so much about a vague idea of amassing a fortune - say half a million pounds - but more a case of being able to generate sufficient income from my assets to replace earned income. If I possessed a little more foresight in my earlier years, I might have put in place a planned strategy for early retirement. Here are a few thoughts on how younger workers in their 20s, 30s and 40s could start to work out a rough figure to aim for their retirement. There are two basic questions to be addressed - what level of income do I need when retired and secondly, what level of savings will be needed to provide that income? So, although this is not a precise science and each individuals circumstances and preferences will vary, here is the outline of a few basic steps towards working out a figure. 1. 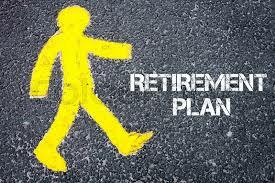 Set a target date for your ideal retirement - it may need to change as the calculations unfold. 2. If you know what income you need fine, otherwise take your current annual net income and deduct 20% as this is the average work-related expense you will not have to spend when retired. So, if your take home pay is £30,000 this target figure would be £24,000. 3. If you have a works and/or personal pension or SIPP, get a projection of the annual amount(s) to be paid and deduct from the above figure. 4. Multiply the remaining sum by 25 to provide you with a ballpark capital sum needed to generate the remaining income. Therefore if the replacement income figure after deducting works pensions was £12,000, the lump sum needed to generate this annual income would be £300,000 (£12K x 25). This is based on a reasonably sustainable return of 4% p.a. from the investments. If you intend to bridge the gap between early retirement and state pension, for example 10 yrs from age 57 to 67, it may be an option to use a lower multiplier figure of say x 18 (rather than x 25) which would obviously reduce the lump sum figure - in the above example from £300K to £216K. The income taken from the lower sum would be nearer 6% p.a. which would be less sustainable long term but certainly a feasible option over 10 yrs. 5. Once you have settled on a final figure and you know the number of years from now to your retirement date, work out what level of savings from your current income would be needed to reach this figure. There are many online calculators available - I use Candid Money . To generate £300,000 in the above example would take just over 20 yrs saving at 20% of salary in an investment ISA assuming 6% average return. If you are saving via a sipp or the new lifetime ISA remember to factor in the HMRC tax credits to your contributions. 6. 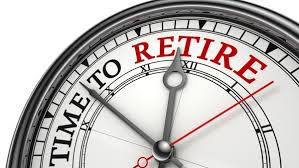 If your retirement date is close to your state pension age of 66 or 67, remember to factor this additional income into the calculations, for example the new flat rate pensions are ~£8,000 p.a. . In the above example, the £12,000 therefore reduces to just £4,000 and the lump sum required comes down from £300K to £100K. Having worked your way through these steps and maybe played around with a number of different calculations, it is time to make a decision. 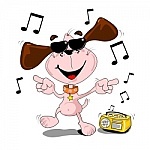 Is it worth cutting back on all but essentials, living frugally and increasing the savings rate to 40% or 50% to bring forward the retirement date by maybe 10 yrs like my fellow blogger RIT has recently achieved? Maybe you could manage on less than current salary minus 20%. Once you have all the information, settled on your ideal retirement date and worked through the various calculations, you can make an informed choice. Without doing the above, you are not really in control of two important elements - how early you can retire and how much you will receive. I suspect, like me, most people will be more focussed on the present and possibly just hope things will work out for the best down the line. In my end of year review for 2016, I made a brief mention of my purchase of this trust for my income portfolio. The advantage of the investment strategy is that it isn’t exposed to the construction risk of new build, as it buys them when they are finished. The revenue stream is highly predictable as the contracts are long term and in many cases government backed. The average infrastructure investment trust has generated a 40% total return over the past three years, according to data from FE Trustnet, compared with a 16% return for the average trust in the UK Equity Income sector. This has caused me to have a look at this sector with a view to providing a little more diverse income stream. 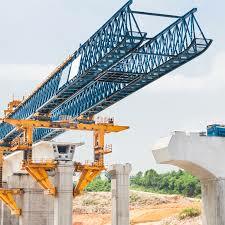 According to data from Winterflood, the infrastructure sector had an average net yield of 4.8 per cent, as at 9 December - “The infrastructure sector has been the shining light in this theme and, with an aggregate market cap of £12.4bn, it is larger than any other single income-focused sector,” it noted. 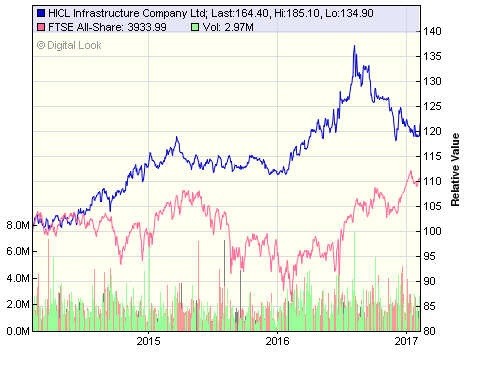 HICL Infrastructure reported an annualised total return for the six months to 30 Sept 2016 of 10.4%, based on dividends paid and an increase in the firm's net asset value (NAV). NAV per share came in at 145.7p, for a rise of 2.5% from March's figure, and dividends in the period of 3.82p per share support the company's full-year target of 7.65p which would provide a yield of 4.6% on today's share price. The target for the following year is an uplift of 2.6% to 7.85p and guidance of 8.05p for 2018/19. A return of 10.4% is very impressive, and if it could be repeated year after year, it would be enough to double my original investment in just seven years - that would be very nice but probably not very likely. HICL announced its investment portfolio value was up 7.9% in the six months, to £2.2bn, and there is a strong pipeline of investments in the planning stages. Total income rose by 19.2%, with pre-tax profit up 19.1%, and dividends declared so far have been lifted by 2.7%. The portfolio comprises stakes in 112 infrastructure assets which have a weighted average concession life of over 20 years. The income yield to shareholders has been consistently 4.5% + year after year whilst average total return over the past 5 yrs has been 12.1% p.a. 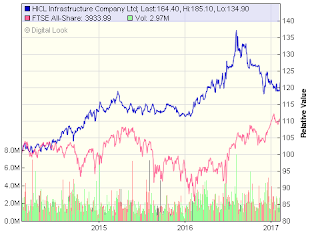 The share price has seen a decent rise in recent years and I am hoping this can continue given all the political talk about investing in infrastructure. However, one reason for the good performance has been the falling costs of debt, and were we to experience a prolonged period of rising interest rates and bond yields then asset values would likely fall. Another point to note is that the shares are currently trading at a premium to their underlying value although this has narrowed in recent months. The shares were purchased in December at the price of 162p. The next quarterly dividend which I expect will be 1.91p, is due to be announced next week. My first ebook, ‘Slow & Steady Steps..’ was published on Amazon Kindle exactly five years ago this month - a year before I started this blog. The following year I self-published ‘DIY Pensions’, followed in 2014 with ‘DIY Income’ and my latest ebook ‘DIY Simple Investing’ was published in June 2015. 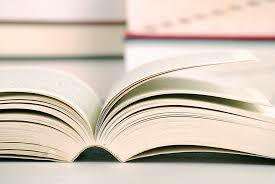 At the end of last year, Amazon introduced a new option to publish a paperback version of the books. Obviously not everyone likes ebooks and many prefer a ‘real’ book to hold and turn pages and underline or highlight certain parts of the book. Over the past month or so I have been busy updating my books and I have now taken up the option to publish 3 of the books as a paperback. 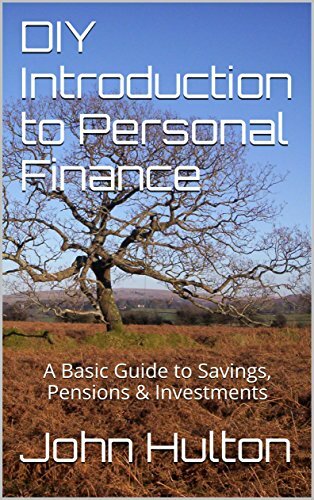 I am currently doing a revised and updated version of ‘Slow & Steady..’ which will be renamed ‘DIY Introduction to Personal Finance’ and hope to be able to offer a paperback version in the next week or so. There are additional costs associated with the printing and also a larger percentage of sales go to Amazon for the paperbacks and therefore the price has to be a little more compared to the ebooks. The prices range from £4.50 - £6.50. Hopefully, I will now be able to reach a much wider audience.